Cecropia peltata is a neotropical tree that reaches heights of 20 m or more. Its stems are hollow, partitioned at the nodes, and bear U-shaped leaf scars. Its leaves are alternate, long-lobed, ovate, somewhat pointed, about 10-50 cm wide, dark green and scaborous above and densley white-tomentose underneath. 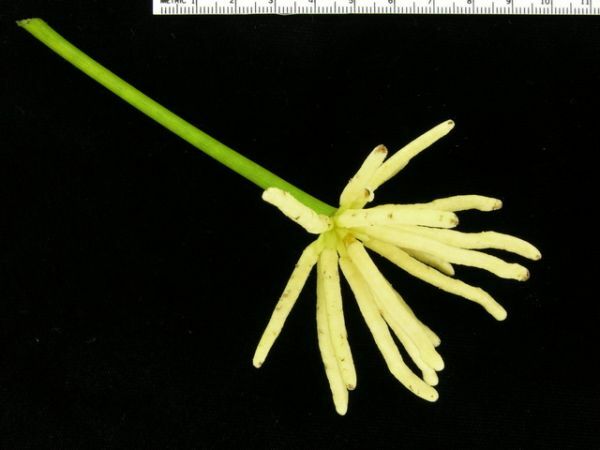 Its staminate inflorescence is an umbellate cluster of spikes 3-5.5 cm long, consisting of many individual tubular calyces with paired stamens, while its pistillate spikes are yellowish and 2-5.5 cm long, thick, and succulent when in fruit (PIER, 2009). Cecropia peltata L was distinguished from C. schreberiana Miq. in 1988. Whereas Cecropia peltata occurs in Mexico and Central America, C. schreberiana occurs in the Antilles and northern South America (Howard, 1988; ISTF, 1997 in Brokaw, 1998; Csuhres, 2008). However, ITIS does not distinguish between the species and, in fact, states Cecropia schreberiana as the valid name for the species and indicates C. peltata as a synonym for C. schreberiana. Seeds of Cecropia peltata require full sunlight for successful germination and with those conditions may be as high as 80-90%. Seedling leaves are pubescent on both sides, lanceolate, unlobed, and finely toothed. Seedlings are also very light demanding and seedling mortality in natural conditions is typically very high. It has been found that 99% of seedlings in forest openings die in the first year. C. peltata grows rapidly reaching 10-15 cm in height in 10 weeks and up to about 2 m in the first year. Reproductive maturity is reached by pistillate trees in 3-4 years and by staminate trees in 4-5 years. Maturation is dependant on allocation of resources for rapid initial height growth and factors such as the height of and proximity to surrounding vegetation with trees in open environments maturing faster than those in forest gaps. C. peltata usually reaches canopy height in about 10 years and its estimated life span is 30 years (Silander & Lugo, undated). Cecropia peltata is popularly cultivated as an ornamental species (Bodkin 1990 in Csurhes, 2008). Cecropia peltata typically inhabits forest gaps and disturbed sites (PIER, 2009), such as, along roadsides, agricultural sites, lava flows, and urban locations (Binggeli, 1999). It is a fast growing, high light demanding, pioneer species that colonizes tree fall gaps in ts native range and is capable of establishing dense stands (PIER, 2009). It is known from altitudes of 50-2700 m (Hurtado & Alson, 1995). C. peltata requires much rainfall and may be found in environments with 990 mm to over 3,810 mm of annual percipitation. It grows in alluvial, colluvial, and residual soils neutral to acidic in nature. Soil texture may range from heavy clay to sandy, but a clay-loam soil is optimal. C. peltata is also generally found in warm climates ranging from montane to tropical with mean annual temperatures of 12-24°C (Silander & Lugo, undated). Principal source: Bingelli, Pierre, 1999. Cecropia peltata L. (Cecropiaceae). Silander, Susan R. and Ariel E. Lugo, undated. Cecropia peltata L. Yagrumo Hembra, Trumpet-Tree. Recommended citation: Global Invasive Species Database (2019) Species profile: Cecropia peltata. Downloaded from http://www.iucngisd.org/gisd/species.php?sc=116 on 22-04-2019. Cecropia peltata forms dense stands that may compete with or displace native pioneer species and reduce species richness (Bingelli, 1999; Dumont et al, 1990). Evidence suggests it competes with and may displace tropical African pioneer species Musanga cecropioides (Bingelli, 1999). Preventative measures: A Risk Assessment of Cecropia peltata for Hawai‘i and other Pacific islands was prepared by Dr. Curtis Daehler (UH Botany) with funding from the Kaulunani Urban Forestry Program and US Forest Service. 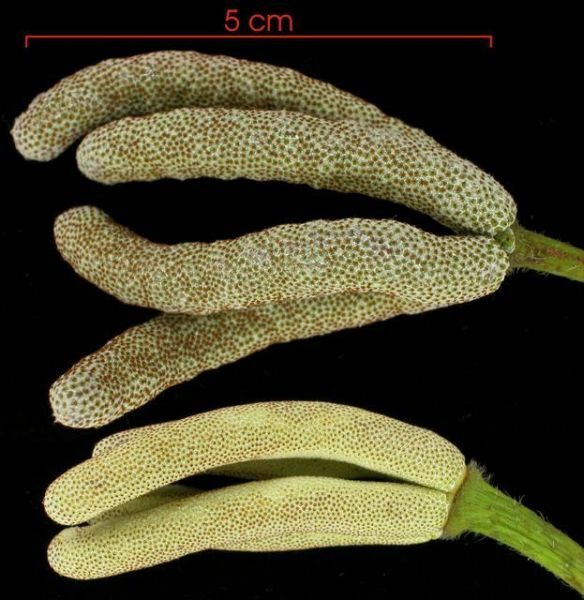 The alien plant screening system is derived from Pheloung et al. (1999) with minor modifications for use in Pacific islands (Daehler et al. 2004). The result is a score of 9 and a recommendation of: \"Likely to cause significant ecological or economic harm in Hawai‘i and on other Pacific Islands as determined by a high WRA score, which is based on published sources describing species biology and behavior in Hawai‘i and/or other parts of the world.\"
\nPhysical: Hand pulling or digging out seedlings and young trees is recommended (PIER, 2009). \nChemical: Larger trees should be cut and their stumps should be treated with herbicide (PIER, 2009). Informations on Cecropia peltata has been recorded for the following locations. Click on the name for additional informations. Dumont, J.F., Lamotte, S. and Kahn, F., 1990. Wetland and upland forest ecosystems in Peruvian Amazonia: Plant species diversity in the light of some geological and botanical evidence. For. Ecol. Manage., 33/34: 125-139. Florence J. Chevillotte H. Ollier C.& Meyer J.-Y., 2007. Cecropia peltata. Base de donn�es botaniques Nadeaud de l Herbier de la Polyn�sie fran�aise (PAP). Howard, R. A. 1988. Flora of the Lesser Antilles, volume 4. Arnold Arboretum, Jamaica Plains, MA. Integrated Taxonomic Information System (ITIS), 2010. Cecropia schreberiana Miq. Silander, S. R. and Lugo, A. E. Cecropia peltata L. (Yagrumo Hembra,Trumpet-Tree). Silvics of North American, USDA Agriculture Handbook 654. USDA, NRCS. 2010. Cecropia schreberiana Miq. Pumpwood. The PLANTS Database (http://plants.usda.gov, 26 March 2010). National Plant Data Center, Baton Rouge, LA 70874-4490 USA.